Also known as twice baked potatoes, These are worth a little bit of work to put a dozen or so in your freezer. They are great for taking for a quick lunch to work, or for an easy meal with soup or a salad. During summer I love to wrap them in foil and put on the top rack of the grill and let them heat up while we are grilling chicken. 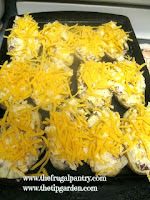 This potato plan has the same base recipe and then 4 variations to make: Loaded Potatoes, Broccoli & Cheddar, Chili-Cheese, and BBQ Stuffed Potatoes. Jan's tip: if you're using bacon, put your bacon on a baking sheet with sides and bake in the oven at the same time as the potatoes. Cooking time will vary so keep an eye till they are crispy. Less mess and saves time and effort! Cut potatoes in half length wise, and using a spoon, scoop out the insides. Be certian to leave 1/4- 1/2 inch of potato with the skin to support the skin and keep it in tact. Leave skins on a baking tray. 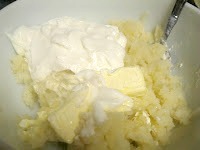 In large mixing bowl, mash the potato pulp and add in all base ingredients listed above. 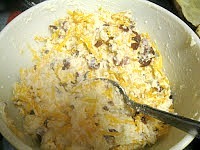 Make sure to set aside 1/2 cup cheese to sprinkle on top later. For the loaded potatoes, chili-cheese potatoes, and the broccoli cheddar potatoes go ahead and mix in the additional ingredients and mix well. For the bbq potatoes mix in the chopped green onions only, saving the bbq for a later step. Fill the shells with the potato filling. For loaded, chili-cheese, and broccoli cheddar potatoes top the filled shells with a little of the reserved cheese. For the bbq potatoes, after filling the shells with the potatoe filling, top each potatoe with the bbq, dividing equally between the shells. 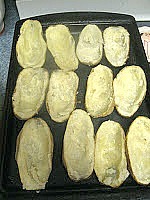 Then top each potatoe with shredded cheese last. For storing all the potatoes together in a gallon sized freezer bag (perfect for baking for families) : Flash freeze, by popping the baking tray in the freezer for approximately one hour till each potato is individually frozen. Then remove and store in the freezer bag. For storing individual potatoes (perfect for grabbing for lunch on the go, or to take to a sick friend/neighbor) before freezing, individually wrap each potatoe in plastic wrap. Store in a zip lock bag in freezer. bake in oven 350 degree's for 30 min. These potatoes. I microwave mine for about 2 minutes, but times will vary by oven.